Update December 2017: Twitter has now fully rolled out an extended character limit for tweets. We’ve updated the content of that post to reflect this. By now you’ve realised that Social Media can prove pivotal to a business. Facebook & Twitter are, for many people, the first point of contact when reaching out to a company. 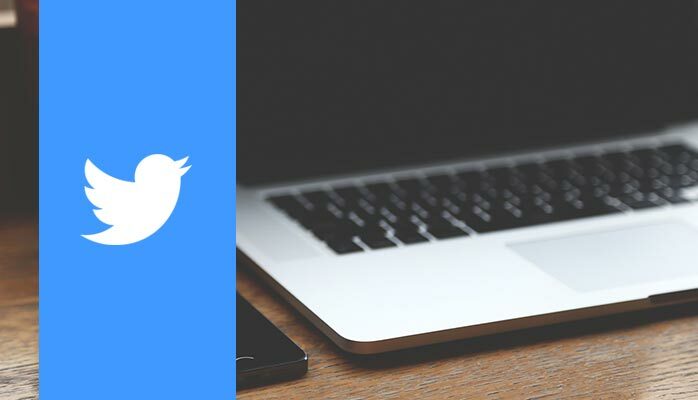 Here’s 5 tips for Twitter success and how to make the most of the networking website as a small business. Remember, if you don’t make it easy for existing and potential customers to contact you, then you can’t expect them to become repeat customers. In this post, we’ll focus on five key elements to ensure that your business is a Twitter success. By the end, you’ll have firm foundations to build a Twitter campaign on, therefore this serves as a great starting point if you’re just becoming acquainted with blue bird social networking site. Your username, a.k.a your handle, on Twitter should match your company name or be as close as is possible, in 15 characters or less. For example, we’re @TadWebSolutions. Using a Twitter handle that matches your company name makes it easier for customers to find you. It’s easier to find @TadWebSolutions that @TeesWebDesign when you’re looking for a company that happens to be called Tad Web Solutions. Add a location. Whether you’re a web agency in Teesside or a coffee shop in New York, if you have just one place of business or stick to one area, then adding an area could be the solution. Remember you’re restricted on characters. If you’re Joe’s Coffee Shop and based in Manhattan and you’ve missed out on @JoesCoffeeShop and other variants, @JoesCoffeeShopNY or @JoesCoffeeNY might be a suitable option for you. Don’t be tempted to opt for @JoezCoffeeShop or anything where you misspell – you’re a professional. Use underscores. Twitter doesn’t allow dashes, which are thought of as a search benefit in URLs. Underscores though, can be interpreted by humans as alternatives for spaces. This should be a last option, as underscores eat up precious characters in your Twitter handle length. Using the right handle on Twitter is the first step towards having a great profile that people will want to follow. This almost goes without saying, but you need to complete your profile. Nobody wants to follow an account that still has an egg display photo. Fewer people will try to contact you on Twitter if your profile isn’t complete – it looks you have taken the time to finish setting up your account, so why should someone waste time trying to get in touch with you? How you do anything can be how you do everything – completing your profile is a key step. If you’re quite happy to complete your profile on your own, you can skip to #3. The Twitter profile consists of a these key elements. 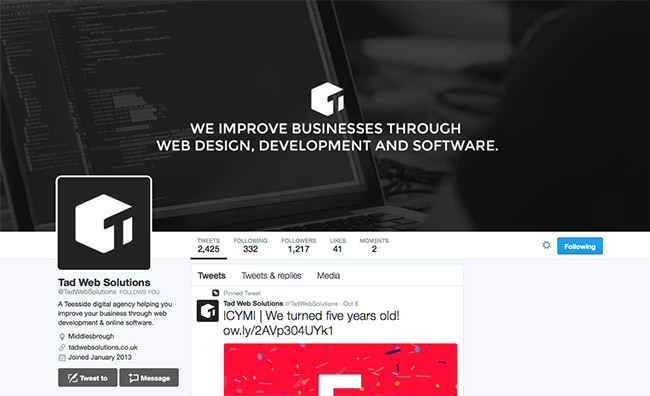 Click the photo to view a screenshot of Tad Web Solutions’ Twitter profile and review each element. Your public name. This defaults to the name of the individual who creates your Twitter account – you’ll want to change it to your business name. You can add spaces and punctuation, so it makes sense for this to be Tad Web Solutions or Joe’s Coffee Shop. Your bio. In 160 characters or less, sum up your business, what you do and if possible, how you’re different. This is visible to the public and could well be the first thing they read about you. Fit in the key details – when are you open? Where are you? Can I sit in? Find us on 24th Street. Serving the finest coffee in Manhattan from 8am – 8pm since 2009. Takeaway or enjoy coffee with a smile in our family-run store. Location. You can either set this as your street, town, state or country – it depends on how far your brand reaches. For independent shops with customers in the close vicinity, you may wish to use ‘Linthorpe Road’. for Tad Web Solutions, our client base is spread largely across the U.K. and thus we rotate between ‘Middlesbrough’ and ‘Teesside’. URL. This is an opportunity to link and drive people to your site. Though that’s not always the best option. For a coffee shop, reviews might be more appealing to potential customers – perhaps use the URL to send people to your Trustpilot or FreeIndex reviews. Display Photo. This photo goes beside every tweet you post. Use your company logo. Cover Photo. This gives you the opportunity to showcase the inside of your store, show off your product or convey information in the form of an image. Twitter cover photos are good for images 1500x500px, so try your best to use landscape image that illustrates your business. By this, what I mean is don’t connect your Twitter account to your Facebook so that your posts are automatically posted to both networking sites. Tweets were previously restricted to 140 characters, now you get 280 characters including any hashtags, mentions (@) and URLs. In May of 2016, Twitter announced a shakeup in how tweets work, but when you’re posting to followers, you still need to stick to 280 characters. Be clear, yet concise. Engaging content doesn’t have to be a tweet that gets tens, hundreds or thousands of retweets and likes. It’s about creating conversation. Twitter’s poll feature serves as a great starter for conversation between a company and potential customers – ask a question using polls and people can leave an an answer anonymously, or tweet you directly from their account and from there begins a discussion. As conversation on Twitter develops, the tweets are published to both yours and the other person’s Twitter timeline, which in the right situation can give you some great brand exposure. Engaging content is also linking to reliable articles in your industry sector – update the general public on what’s happening in your area or your field. Leaving your input in the form of a tweet whilst linking to an article in the news conveys that you have a viable insight, in most cases. Of course, don’t forget about hashtags. There’s somewhat of a dark art to hashtags – too many and your tweet looks like spam, too little and your tweets might not gain much traction for people to find you. My personal recommendation is to use an absolute maximum of two hashtags per tweet, and don’t include them in every single tweet you post, it’s unnecessary. Where possible, try and fit your hashtags into the context of your tweet, rather than adding them all to the end of your post. Only use hashtags for what people are likely to genuinely search for. Good morning followers! Our #CoffeeShop on 24th Street is open from 8am this morning – we’ve got your coffee waiting! The above reads a lot better than this. It’s worth noting that polls also serve as a great way to do a bit of market research. If you’re looking into launching a new brand of coffee, which tyre do your customers prefer the most? Twitter polls can help you. Here’s a Twitter poll I posted to my ‘personal yet business’ Twitter account a few weeks back whilst doing some research into customer relationship management. 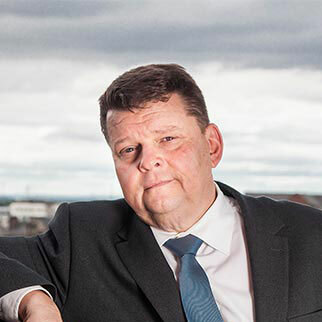 To ensure people that were outside of my followers also saw it, I included the #NorthEastHour hashtag, which is a Twitter networking event and a hashtag that many business owners actively follow in the region. Hoping you can help #NorthEastHour, if you wanted to contact a company, which method would you prefer to use? Poll. The above tweet (you may have to click and view it on Twitter) includes a poll with multiple options for people to anonymously select but several people have taken it one step further, they’ve replied to me and stated why they’ve chosen that option thus creating organic conversation. Hashtag. #NorthEastHour is a hashtag actively monitored by business owners and sole traders in the North East of England. They were also one of my key areas to gain an insight into in my market research. The hashtag is relevant and posted in the correct context. Wording. Let the your followers feel in control. ‘Hoping you can help’ gives the reader the feeling of authority, the feeling that their answer is incredibly beneficial, which in this case it is. This encourages them to respond and therefore you gain a valuable insight. But you’re not always posting a poll – what if you’re linking to your website or blog? Image. Ask yourself, are you more inclined to read a tweet that is purely text, or a tweet with an image? Websites like Pixabay provide royalty free images that you can use as you wish to fill your blog with high resolution images at no cost. The resources are limited, but they’re free. Hashtag. Again, there’s a relevant hashtag. Avid Apple users were reading frantically about what to expect in Apple’s iOS10 – my post provided an outline of the features to expect before it was released. Using the #iOS10 hashtag was relevant and used in context. Wording. The wording of the tweet provides readers with an outline of what the article is orientated around, without giving away the main content. Impressions. How many people saw your tweet by visiting your profile, by being mentioned in your tweet or by having your tweet retweeted onto their timeline by someone else. Engagements. This number is a combination of how many retweets you collected, how many times the tweet was clicked to expand, how many people visited your profile from your tweet, how many people clicked a link in your tweet and how many times it was liked. Each interaction qualifies an ‘engagement’. Track the performance of your tweets to see which ones work best – are you tweets including polls receiving a lot of attention? Are your tweets with the photos from that pricey photographer gaining you retweets? 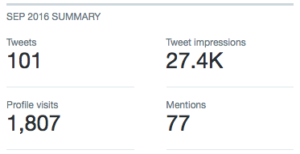 Using some trial and error posting and then following up with analytics, you can begin to create a solid Twitter campaign. If you’re really interested in becoming a Twitter ‘guru’, then I recommend using Klout. Klout is a free tool that gives your social media ranking a score from 0 to 100 – the higher the better. The average score is currently around 40, with users that score 63 ranking in the top 5% of the Twittersphere. The rating from Klout is how much of an influencer you are, The Huffington Post and The Guardian score highly as a news distributor. You can build your influencer score by sharing external links, giving your insight and building your follower base. Klout also works with various other networking sites such as Facebook and LinkedIn. The more networks you have linked, the higher your score can go. Klout score is not an average score, it’s an accumulation score. It’s understandable that after 6 months and only gaining a 100 or 200 followers to want to give up and feel like the time invested in Social Media, or just invested in Twitter, isn’t worth it. Personally, the first thing I do when visiting a new Twitter account is scroll back to see how frequently it’s updated. What does the account post about? I’m not going to follow you from seeing one tweet, I want to build a consensus. This is where your perseverance pays off. Accounts that post content that creates engagement, interact and reply with potential customers, use images and understand hashtags are the most likely to gain an organic follower base. Twitter can be tough, but it’s important you persevere. Using the tools outlined in the post, you can begin to post content that creates engagement. You can then track the performance of that tweet and begin to build a campaign. You’re on the path to Twitter success. This works best when you have a target in mind of how many followers you’d like to reach. That way, you constantly have a goal you’re working towards. You’re able to quantify your results so far. The links in this post are not endorsements and nor am I or Tad Web Solutions affiliated with them. These are tools that have genuinely been used in our workplace to improve performance on Twitter. I hope you find them of use. If you have any questions or would like to leave your thoughts, please leave a comment. You can also tweet us, @TadWebSolutions, or the author directly, @PeterACalvert.